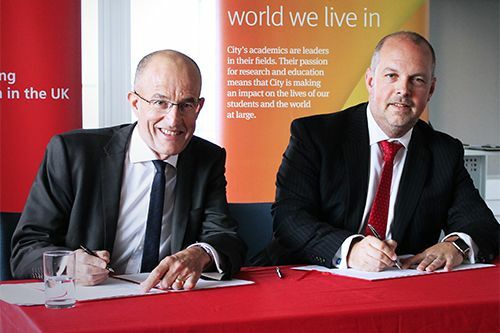 For the 10th consecutive year a partnership has been agreed between City University London and Santander Universities. At a celebratory event staff from City and Santander Universities gathered to witness Vice-Chancellor of City, Professor Sir Paul Curran and Managing Director of Santander Universities UK, Robin Foale sign the new contract. The generous support from Santander Universities will be focussed on supporting students through scholarships and awards, entrepreneurship, career support and more. Over the past 10 years funding from Santander Universities has now totalled over £1 million. The money has gone towards supporting over 200 students in their studies and various programmes and initiatives including entrepreneurship events and internships. Santander is now the world’s largest donor to higher education spanning 20 countries and supporting over 28,000 scholarships and grants, according to a report from the Varkey Foundation in collaboration with United Nations Educational, Scientific and Cultural Organization. This venture began with Cass Business School which was Santander’s first educational partner 10 years ago. On becoming Vice-Chancellor at City, Sir Paul extended this relationship to the rest of the University.